Meeting your business objectives while controlling costs, ensuring compliance and managing corporate travel risk – that’s what success looks like in the rapidly shifting corporate travel landscape. Your travelers want dynamic and tailored travel options, self-service technology and trip add-ons. You want to deliver. Managing corporate travel in today's complex environment demands that, together, we find balance through smarter spending and configurable solutions – with more personalization, speed and convenience. With flexible integration in enterprise-wide systems and automated customization, we are equipped to meet every stakeholder’s needs through our end-to-end solutions. Travelers can plan, shop, and book with personalized choices, all within corporate travel policy guidelines and with your preferred travel partners, perfectly integrating into your workflow. Whether you are a corporate travel manager, business traveler, or travel management company, our omnichannel products deliver efficient, trusted and cost-effective results. By enabling you to achieve your cost-management objectives, while minimizing travel program fragmentation and ensuring a seamless and productive traveler experience across all channels, we help sharpen your edge. Configure custom travel policy rules across geographic regions with traveler alert capabilities. Plus, our mobile solution allows travelers to manage their itinerary and make changes during all stages of travel. 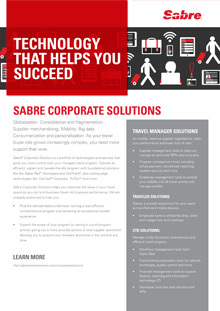 If you are a Sabre Connectedsm corporation or agency, please contact your Sabre account representative.